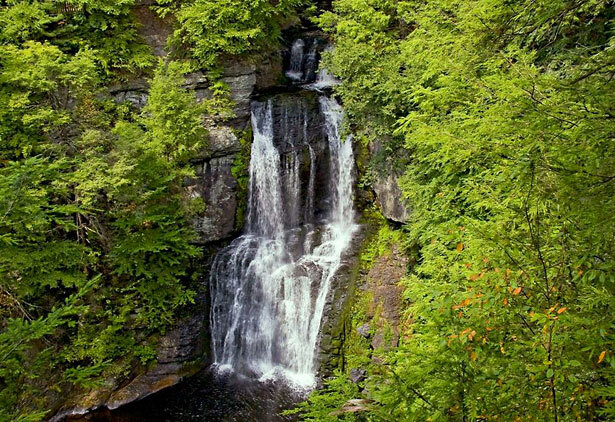 In celebration of National Trails Week, join naturalist Sue Thompson for a pleasant day of visiting several of our regions spectacular waterfalls. Sue will provide, not only information on the history of each fall and the surrounding area, but also interesting bits and pieces about the plants and animals met during our gentle-moderate walks to the falls. Bring a lunch, wear sturdy, non-slip shoes, and a poncho if it looks like rain. The trip will be cancelled only if rain is intense at which point you will be contacted early the morning of. Meet at the PPL Lake Wallenpaupack Environment Learning Center off Route 6, Hawley, PA at 9 AM. Return will be approximately 5 pm to the same site. Fee: $5.00/adults; $3.00/children under 12 y/o. 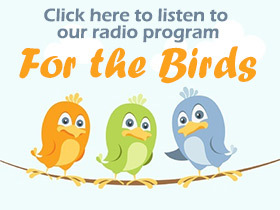 All proceeds go to Northeast PA Audubon Society. Registration is required. Call Sue at (570) 253-4006 for registration or further information. We had a great turnout of volunteers on Route 191 south, Lake Ariel area, for our Adopt-a-Highway cleanup on April 13, 2013. Shirley Chmielewski brought a 4-H group called “Giddy-up and Tally Ho.” Becky brought Lucas Singer, Chris Black brought Darlene, Alexis Roussiau — Justin, Jason — Miranda, Cindy Minew — Karli, Barbara Hutchins — Angelic, Jessica and Johnathan …. Also participating were Albertine Falkenhein, Carol & Roger Homeyer, Kathy Dodge, and Marge Brion. We collected 19 bags of garbage, and 9 bags of recycling. The highway looked nice. Thank you to all the people who don’t throw out of car window, you are part of our group to make it look nice. Audubon treated us to breakfast at Liberty restaurant afterwards. Penn Dot supplied, bags, vests, gloves. 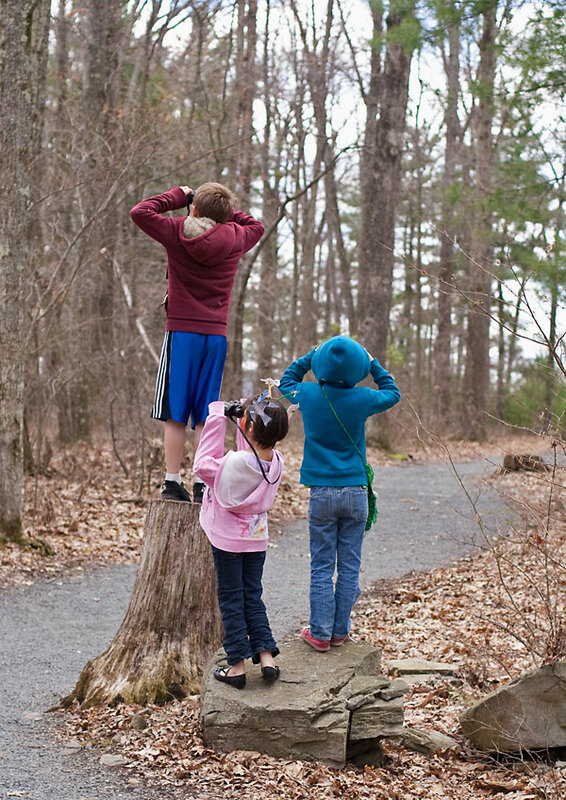 Three young birders celebrating Earth Day on one of many bird walks given by Northeast PA Audubon at the 2013 Pike-Wayne Earth Day Festival. Barbara Leo, Joan Thirion, and Katharine Dodge led walks throughout the day. Thanks to Promised Land State Park for loaning us binoculars for these walks. The theme at the 2013 Pike-Wayne Earth Day Festival was species diversity as this is the 40th anniversary of the Endangered Species Act which has saved 29 species from becoming extinct, but still lists 1,439 species as endangered or threatened. Volunteers helped people don masks, headdresses, and painted faces depicting myriad species of animals, insects, and plants. 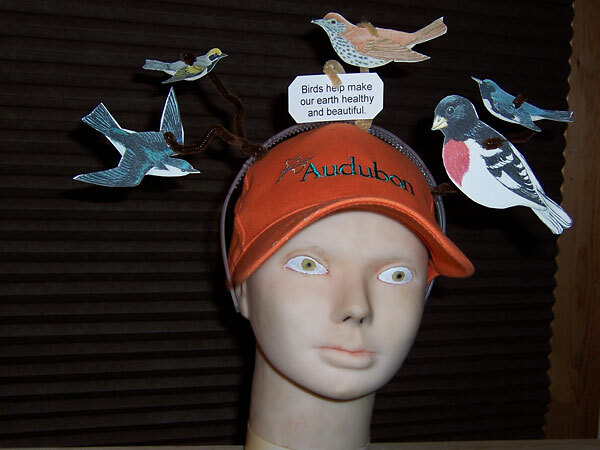 Volunteers at our table helped people assemble headdresses of neo-tropical or migratory birds to wear along with a little note saying “Birds help make our earth healthy and beautiful.” Thanks to Marge Brion, Nancy Savage, and the Higgins family for helping with this!